While staying with us in Panguitch Utah, you can find plenty of things to do in and around the area that will bring you memories to last a lifetime! Exploring the area is an adventure one must make at least once in a lifetime, however, the magnificent scenery, breathtaking rock formations and the spirit of the magical hoodoos just might bring you back to Panguitch year after year. As your eyes capture the awe-inspiring scenery of our National Parks and Monuments you can become speechless as your heart pounds in anticipation of what you will see next. To capture spectacular view to share with your family and friends - get up at the crack of down or visit one of the parks just before sunset, bring your camera, and get ready to experience some of the most breathtaking views imaginable! Listed below are a few of the most popular attractions and things to see and do while staying with us. For more information step into our office and we will be more than happy to help you plan your trip. You can also visit the local visitor center and pick up maps and literature to help you find your ultimate destination. Our lodgings offer our guests clean, comfortable rooms in a log cabin style. Enjoy all the comforts of a home away from home, with world-class scenic destinations. Our philosophy is simple. We have selected items with flavors that marry well together. All you need to do is join us and savor our creations. We look forward to sharing our passion for food and good company with you. What beauty my eyes behold as I look out over the multi-colored art work that nature has provided for me to enjoy! I stand in awe at the passion of the creator, and try to comprehend the patience of having these towering formations evolve for millions of years, unfolding even more glory, year after year. As I stand gazing for miles at the towering archaeological formations, I realize that I am truly blessed to be here, at this moment, and cherish the gift which has been placed before me. Bryce Canyon National Park is known for having some of the most beautiful scenery throughout the world. 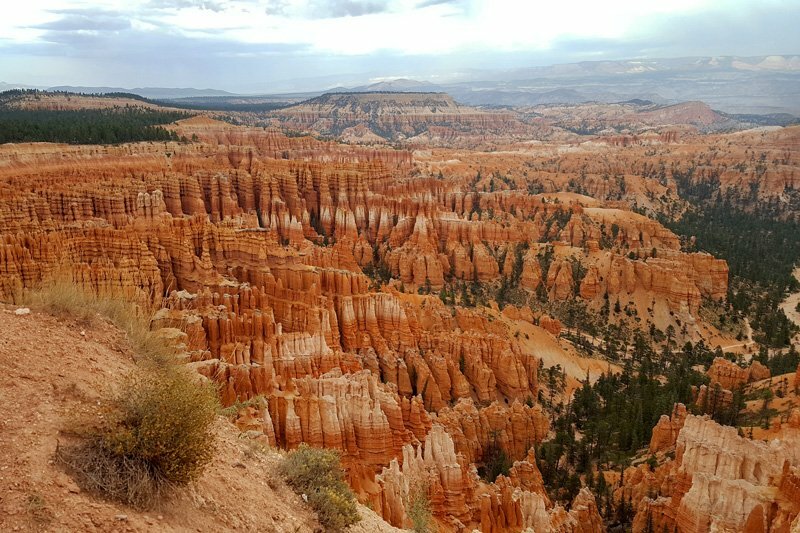 Over 1.5 million people travel from all around the world to reach this destination to see the magnificent beauty of Bryce Canyon. It is an international hot spot for tourists and photographers alike. What are the Hoodoos? A Hoodoo is a pillar of rock, usually of fantastic shape left by erosion. These formations called hoodoos have taken upwards of tens of millions of years to evolve into what we see them as today. These famous hoodoos are shaped, reshaped, and colored after millions of years of water, ice, run off, earthquakes, rivers, mudslides, wind and other kinds of erosions which formed the unique spirals. These ancient sedimentation have vast differences in colors of deep reds, oranges, tans, and whites. It has taken millions of years to obtain all the different levels of sedimentary rocks, that show you different ages of this earth. As your eyes fall upon this magnificent display of color you will see something magical take place as the light and moisture captures and changes the awe inspiring colors of these towering rocks. On both western and eastern ends of Bryce you have two major water networks including both the Paria river valley (east), and Sevier (west). These long time drainage valleys had greatly contributed to the shaping of these beautiful landscaped treasures. Enjoy viewing native rock art and hike to a peaceful waterfall. Take your time and enjoy the serene surroundings. The falls are 12 miles east of Escalante on Rte. 12. You can now book your room on-line on our secure reservation service. With over 1.5 million visitors coming from all over the world to see the spectacular and famous Bryce Canyon National Park, Red Canyon, Zion National Park, Capitol Reef National Park, Grosvenor Arch, along with outdoor enthusiast who come for the excellent fishing and hunting opportunities we provide in the area, you will want to book your room well in advance!